One Man's Ramblings, v.2: Is lighting up the season harmful to our National Interests? Is lighting up the season harmful to our National Interests? After work last night I drove through a neighborhood that was very much in the festive holiday spirit. Many homes had elaborate and colorful Christmas lights set up, and I enjoyed looking at all the lights as I made my way to a friend's house for dinner. While enjoying the scenery, though, a downer of a thought came to me. How do all of the light displays erected in the USA every winter affect our energy use? I frequently leave PCs running in my home 24/7, and it's noticeable in my electric bill each month. In fact, I moved my home webserver from an Athlon-powered desktop PC to an old Pentium-2 laptop specifically to lower my electricity use. 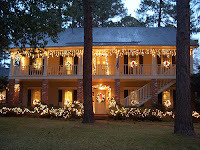 Do Christmas light displays have any significant impact on our country's energy consumption? Does the happiness generated by the displays offset the cost, on a national level? Do Al & Tipper run a Christmas Light show? Maybe an enterprising entrepreneur ought to come up with some sort of small scale solar power system that could bank enough juice during the day to power simple christmas lights through an entire night. The device could plug in to the home electricty for supplemental power when it couldn't sustain the load itself. If feasible and under $50, I think that might be an excellent product.